It’s no secret that first impressions are powerful. It really is true, you never get a second chance to make another first impression. Research proves that it takes only a tenth of a second to form an impression of a stranger from only their face. When you begin to factor in a person’s choice of clothing, body language, and appearance, the stakes are even higher. According to several studies, 90% of people form their opinion about you in under less than a minute of an initial introduction. In a job interview, this means that a potential employer could have made their decision of whether or not to hire you before you’ve even begun the formal questioning. 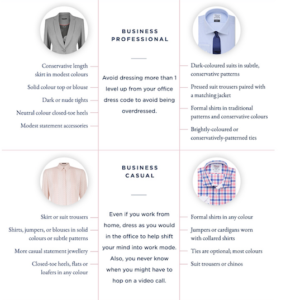 Does the phrase “business casual” fill you with confusion and uncertainty? What really defines business casual from business professional or formal? 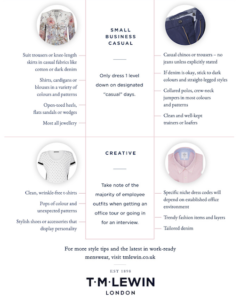 Deciding what to wear for an interview or a day at work is becoming increasingly more perplexing. Office environments continue to change and traditional standards of professional dress have surely become more relaxed. What is acceptable and appropriate to wear to an interview or new work environment remains subjective and universally undefined. Beyond the employee handbook (often received after the interview/offer letter) there is no concrete definition for what warrants an appropriate outfit from the next. Of course, in any work environment a dress code is circumstantial to geographical location, workplace culture, corporate policy, title or position and the field or line of work. One thing that remains unquestioned is the importance of a positive and polished appearance on interview day. Even the best candidates who have crafted the perfect resume, completed their research about the company and their potential role forget to also consider the office dress code. There are many ways to gain an insider’s insight prior to the interview. Be observant while dropping off a resume or while in attendance for an office tour. If the job prospect is local, consider casually walking around the lobby or possibly sitting in your car in the parking lot to watch what people are wearing. If your target company is remote, you may be able to gain some insight from company photos of employees, especially in groups versus professional headshots. T.M. 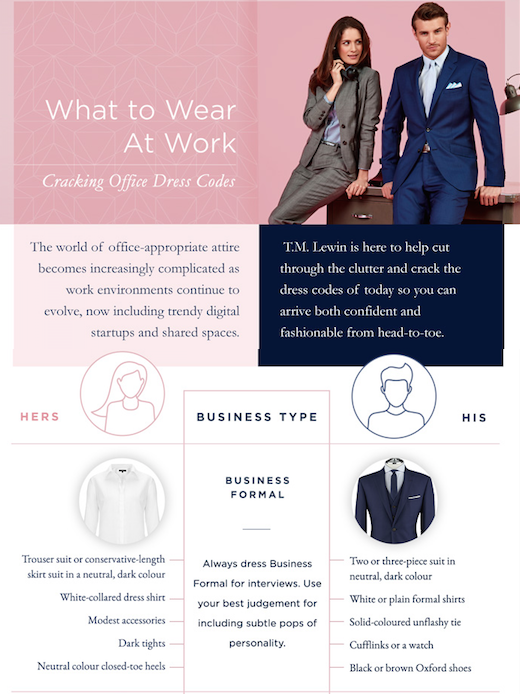 Lewin, experts in office-ready work-wear in the UK, has helped to decipher the professional dress code puzzle. They have crafted the savvy guide below as a perfect tool for aspiring jobseekers, with plenty of style references, tips and advice for our modern workforce. Please note that while the guide has been developed for the European workforce, it can easily be adapted to what you learn upon researching the interviewing company. T.M. Lewin is a British heritage brand established in 1898 on Jermyn Street in London. Experts of smart style and dressing our modern working world. is a British heritage brand established in 1898 on Jermyn Street in London. Experts of smart style and dressing our modern working world. If you are a job seeker, do you know about “Magic” Sourcers? Well, really known as “Sourcers,” they are the people who are constantly mining candidates who might fit a company need at some point in the future. Recruiters often do sourcing as part of their job, but “Sourcers” focus exclusively on finding potential candidates. If they can find you, then lots of job search “magic” can occur! Sourcers can be internal HR people or external recruiters. Their task is to build a database of ideal candidates to tap into when the company is ready to fill a job. This saves a lot of time trying to find the right candidate when the company has an urgent need. By doing your homework, you can position yourself in places to be found and “whal-lah!” you will exponentially shorten your job search…MAGIC! So where do Sourcers look for candidates? They SLEUTH for information about a specific field of interest. They will research everything from what the position entails, what skill sets are required, what publications those professionals read, what associations do they belong to, what conferences do they attend, and more. >>> Social Media – your posts, profile, comments, demos, slides, and more! >>> Industry Publications – have you written articles? Are you esteemed in your industry? >>> Conference Speaker – are you sought after as a speaker? Are you an expert in a specific niche? So how can you increase the odds that they will find you? Most important, know where Sourcers are sleuthing for you. Then build a strong digital presence with profiles that provide highlights (not tons of detail) of who you are and what you can do. “Be seen” by creating intelligent content on blogs, comments, and posts. Elevate your digital footprint and you WILL be found! Job search is not static. All of the parts move and change ALL of the time. The question is, are you static? Maybe it’s time to stop, breathe, and take a fresh look at what you are doing and what your career documents are projecting about you. Are they interacting effectively in the job search market? Is your résumé projecting the right target? Can the reader quickly see what type of position you are targeting? Do you have a summary section? Sounds obvious but many job seekers miss this opportunity to market themselves here. Your summary should include words that match job titles and the level of the position you seek. It must be a snapshot of what makes you a great candidate and showcase the value you bring to the table. Do you have a presence on LinkedIn? This is a critical vehicle for your online presence and for business credibility. Recruiters are incredulous when a job seeker does not have a LinkedIn profile. It’s as if the person is antiquated because they are not using business social media. So, create a profile! Make it powerful, truthful, and concise. Showcase your highlights…not your résumé. Use your page to learn and share info on “Groups.” And build relationships – not just numbers – by connecting and engaging others. Are you face-to-face networking at professional association meetings? These groups are filled with colleagues who are in your profession! Go to meetings. Develop relationships with others in your field. Volunteer in the organization. Pay it forward. Listen to speakers to learn new things. Good things will happen from this. Remember to keep this up even AFTER you get your new job. It is part of a life-long career management strategy, not just when you are in need of a new job. Hope these ideas will help you take a fresh look at what you can do to jump start your search in 2016. Happy New Year! It can be hard to stay motivated in a job search when we all know what the current job market is like. Plus, so many others we know are worried about their job security or maybe even recently downsized…which makes us feel worried, too! There are industries with no jobs, companies shutting down, and bills piling up. So, how can you stay positive and keep on searching during a difficult economy? Be sure you are realistic in your search – Are you targeting positions that you are qualified for? If not, explore your options. Enjoy a hobby or fitness activities – It may help to have a release for any negative energy and will probably put you in a happier, healthier frame of mind when you meet others. Enlist the support of friends and family – Let them know how they can help you. Be frank if they are pressuring you unreasonably. Include them in what steps you are taking to reach your goals. Learn something new – Learning new things can motivate you to feel excited about yourself, and could potentially help you in some way. Be interested in others – Listen to what is going on for them and see how you can help in any way. Consider a part-time position – Perhaps there is something part-time or flexible that would bring in some money to help with the bills in the meantime. Check out job transition groups – These can be a wonderful support to you during these times, and most likely can help with effective, productive strategies for your search. I hope these tips help you in some way! Best of success in your search!